Every year our corn maze has a different theme and we hide trivia questions within the maze all related to that year’s theme. Guests are given game sheets with spaces to record their answers, as well as other fun activities related to the theme. 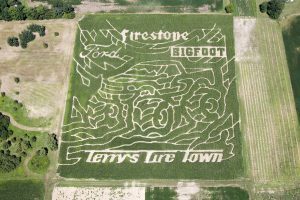 Admission to the corn maze is included with your admission to the fall harvest area. Charges vary with the day of the week – visit our hours and admissions page for details. Your admission is good for the entire day, so if you get tired or hopelessly lost, you can always exit, get something to eat and return to the maze later. It is time to start booking your fall outing, company picnic, church youth group, campfires, or whatever your posse may be! Please note not all attractions run on weekdays please call for availability. How do we cut this maze? 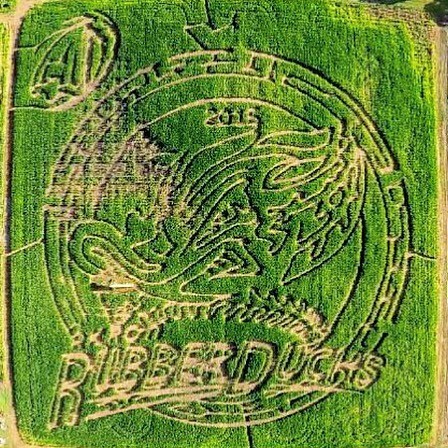 Read our blog – Ohio Wine & More, and watch a video of our corn maze being cut. There is a lot of time, effort and expense that goes into creating our maze each year. Your admission is good for the entire day and includes: corn maze, unlimited wagon rides, unlimited barrel train rides, NasHog pig races, pumpkin cannon demonstrations, animal area, straw crawl, tire pile and all of the kids play area activities. Pumpkins, food and wine tasting are an additional cost.